Visit our showroom and you’ll find an extensive line of fashionable Hunter Douglas Window Treatments, at a range of price points. When it comes to window treatments you'll need to look no further! We offer quality products from Hunter Douglas®, Kirsch® Window Treatments, and more. Whether your windows are standard size or custom arches, we've got the know-how and talent to help you create the ideal treatment for one room or the whole house! 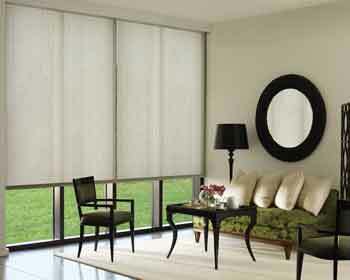 Visit our showroom and you’ll find an extensive line of fashionable window treatments, at a range of price points. We carry the nations top brands, providing a variety of configurations, designs and materials. Choose from the latest in vertical blinds, wood and faux wood blinds, woven woods, cellular and pleated shades, custom draperies, decorative hardware and even custom cornices. Whether you have standard size windows or large custom arches, we have the products and the expertise to help you put the finishing touches on any room. Choose from the latest in vertical blinds, wood and faux wood blinds, woven woods, cellular and pleated shades, custom draperies, decorative hardware and even custom cornices. Whether you have standard size windows or large custom arches, we have the products and the expertise to help you put the finishing touches on any room.